The scene at the Halifax on Windsor Court in Morley. 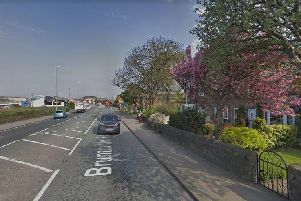 A £25,000 reward for information has been offered as police hunt two men who staged a terrifying armed raid at a bank in Leeds. The men, who were both wearing balcalavas and carrying sledgehammers, smashed their way into a branch of the Halifax on Windsor Court in Morley on Thursday evening. 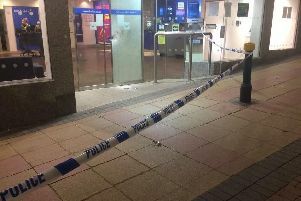 On Friday the bank remained closed, with part of its front entrance boarded up after being damaged in the raid. The bank had closed for the evening when the raiders struck, although a number of staff were still at work inside. They locked themselves in a secure area of the premises until the robbers fled empty-handed. A witness today told the YEP how the drama unfolded in the busy shopping precinct. The woman, who works at another business on Windsor Court and asked not to be named, said: “We didn’t see anything at first but we realised something was happening as there was loads of noise all of a sudden. “I looked out and saw these men having a go at the door of the bank. “We just locked our own doors and I think everyone else along here did the same. Police today revealed that the raiders left the scene in a silver-coloured car. Det Insp James Entwistle, of Leeds District CID, said: “This was obviously a frightening experience for the members of staff involved but thankfully they were able to get themselves to safety and nothing was stolen. Confirming details of the reward this evening, a spokesman for the Halifax said it had been made available as part of a banking industry scheme.